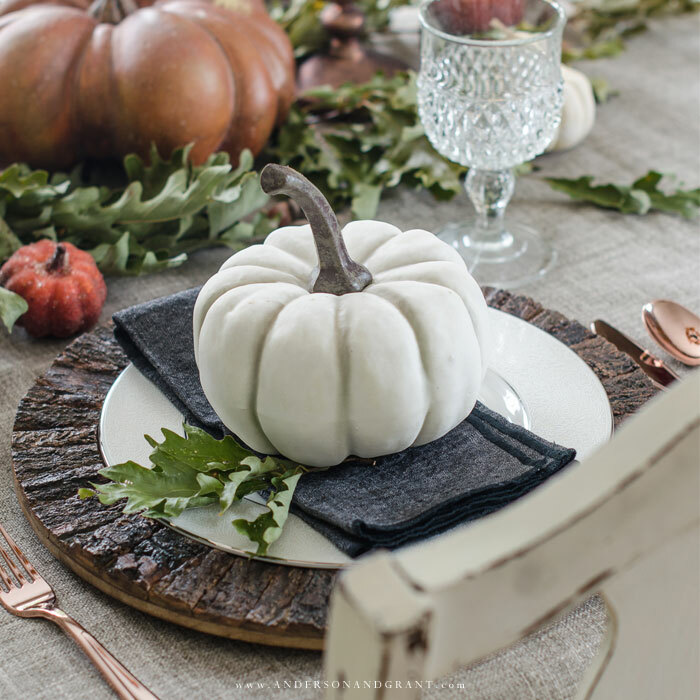 With Thanksgiving just a few days away, I wanted to share a few tricks I've learned that have given me more confidence in setting a table I can be proud of. There is enough to prepare the day of Thanksgiving dinner. And you want to be sure to have a little time to kick back and enjoy a bit of the Macy's parade or savor the final moments of calm before the Christmas season hits. 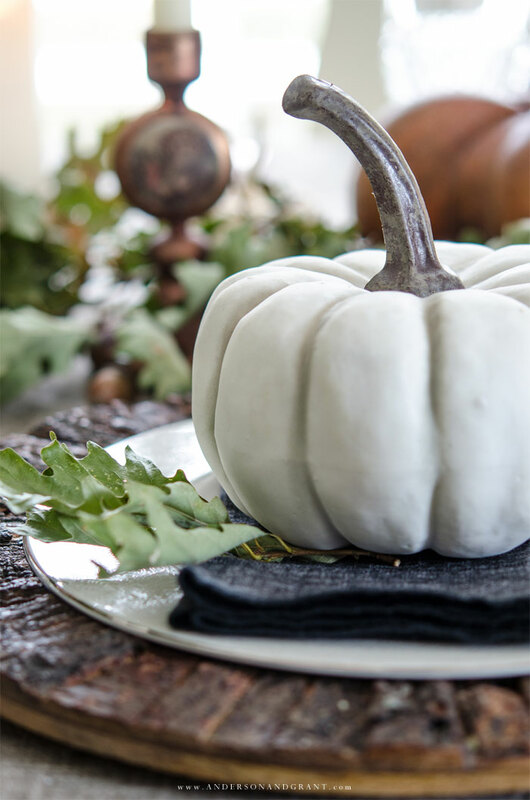 Anything that you can do ahead of time, from baking your pie to setting the table, will keep the day running more smoothly than trying to do it all at the last minute. 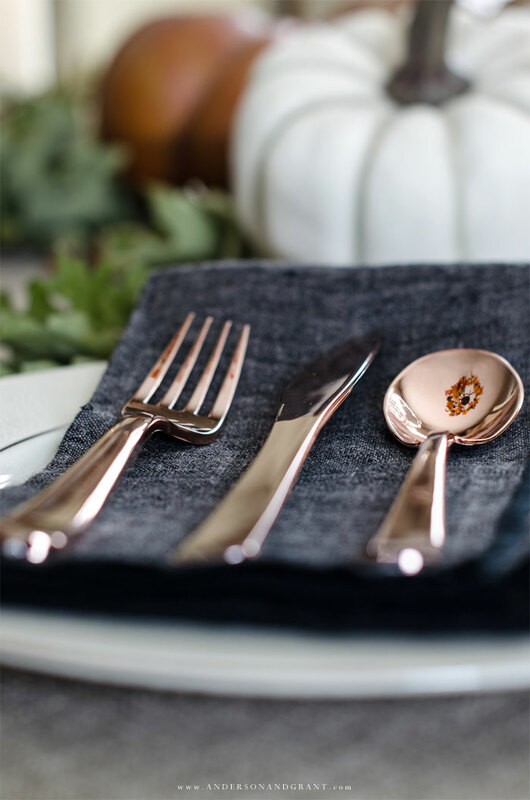 I loved the contrast between the black linen napkins (picked up at Target from Smith & Hawken), white pumpkins, and copper silverware. 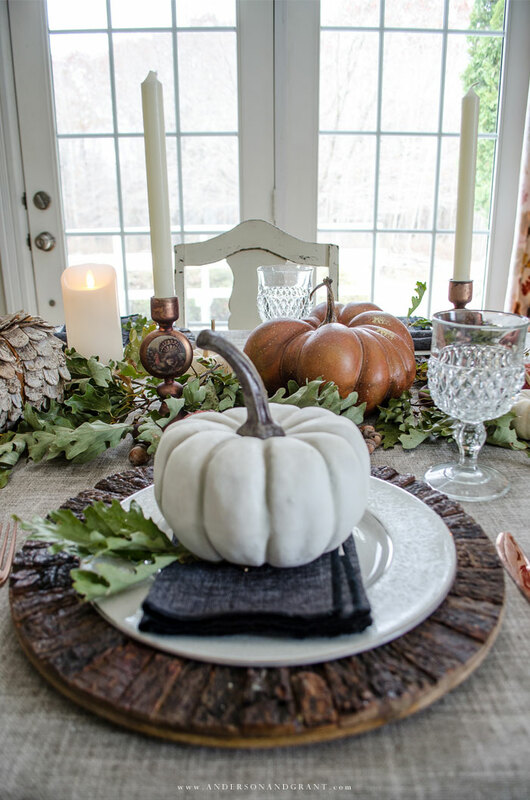 Not a traditional Thanksgiving color pallet, but mixed in with more pumpkins, oak leaves, and acorns there is no mistaking that this is a fall table. Don't be afraid of putting things together that you wouldn't normally mix. 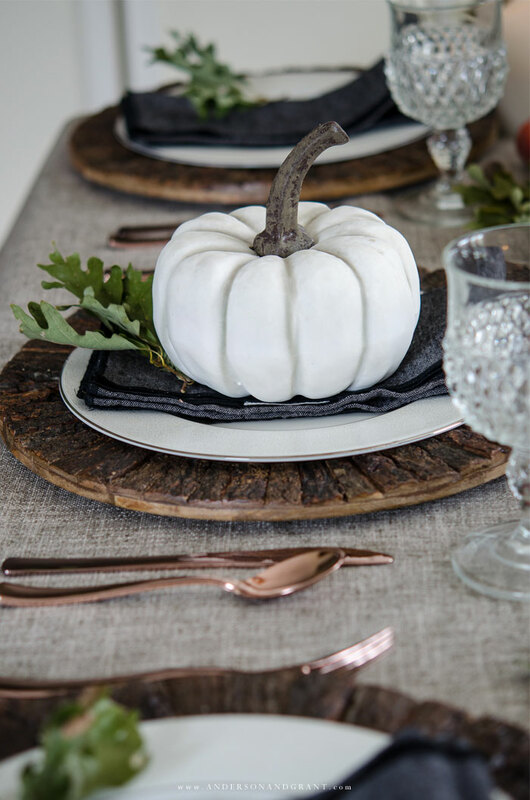 Using different textures adds to the interest of any tablescape. 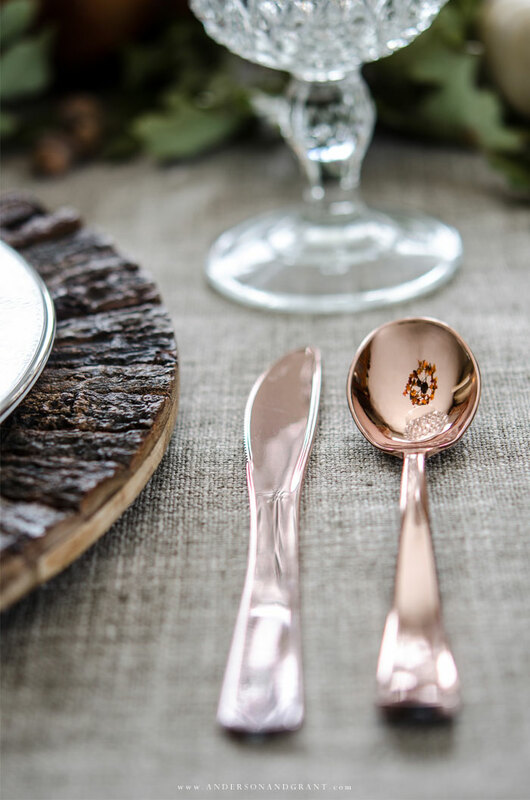 The rustic wood chargers paired with a heavy linen tablecloth and sparkling crystal glasses might be an odd combination, but still look beautiful together. 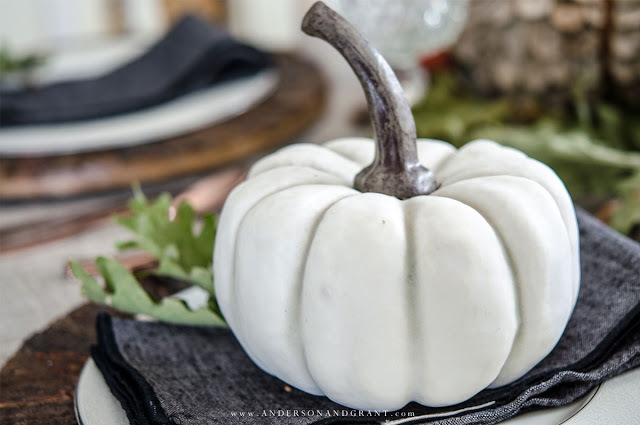 Because it isn't necessary to stick to a specific color palette or style, you can really shop your home and use what you already have to create an interesting table with character. 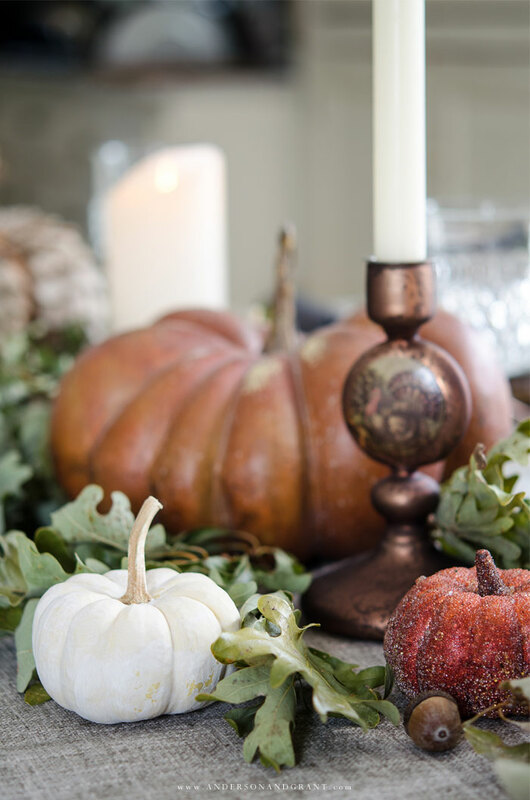 The centerpiece here has been made using a "runner" of dried oak leaves tucked around various (faux and real) pumpkins and candles. Acorns were sprinkled throughout the display. 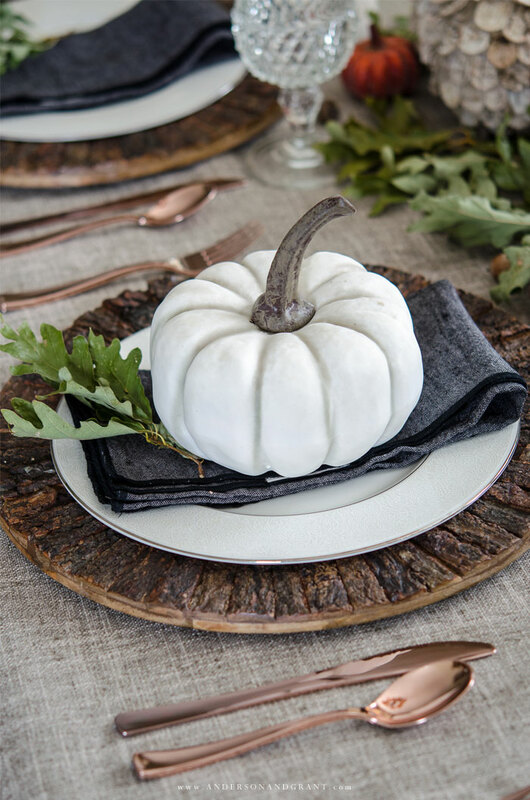 And a sprig of leaves were also tucked in with the pumpkin favor on each guest's plate. For the most part nature is free or very inexpensive and fits into any style. 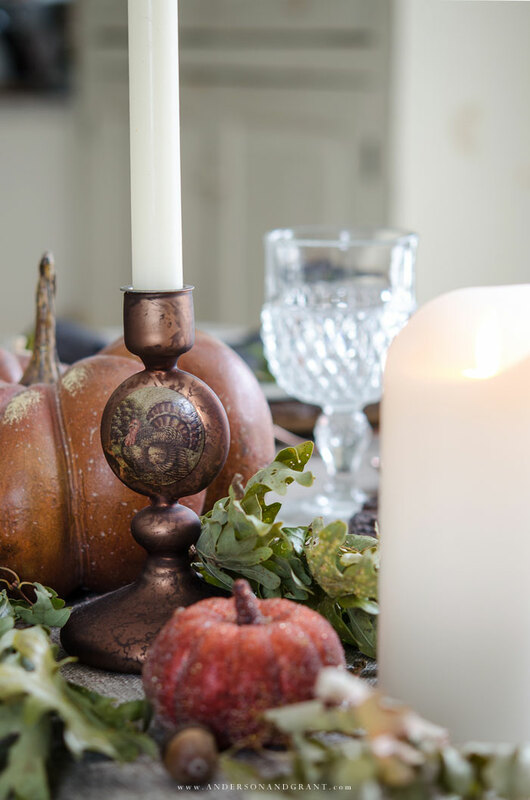 While we all want our table to look pretty and be awe inspiring, what is more important is the comfort of the people gathered around the table. For that reason, whatever you place in the center of the table should be low enough for people to be able to easily see the person sitting across from them. Keep things below eye level as much as you can. And for things like taper candles that are taller, stagger them in the display so that they are out of the way of direct sight lines. I don't know a single person who doesn't enjoy receiving a little gift or keepsake from the day. It doesn't have to be anything expensive or elaborate and may even be something you create yourself or an edible treat. 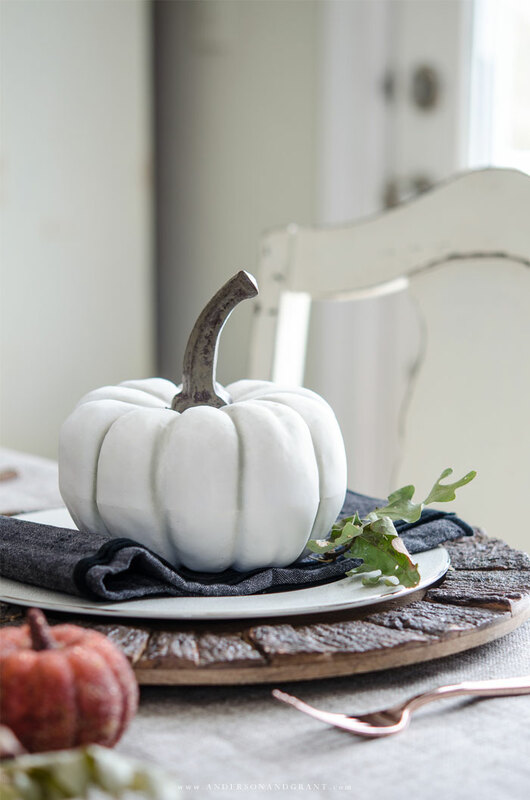 These white pumpkins were from the Dollar Spot at Target and are something your friends and family can use to decorate their own homes next year, hopefully reminiscing about the Thanksgiving dinner their enjoyed at your home the previous year. 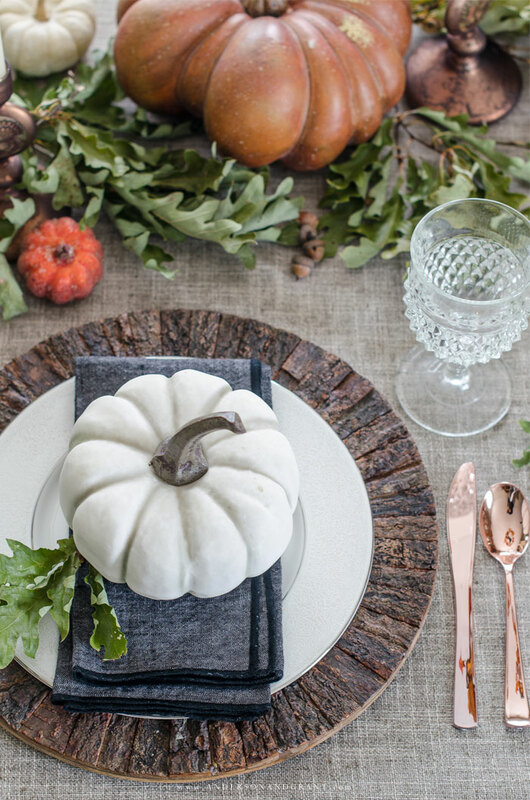 As an extra tip, since you want to ensure that there is plenty of space for food and comfort at the table, set aside a spot somewhere like the kitchen counter or buffet where everyone's personal item can be placed during the meal. 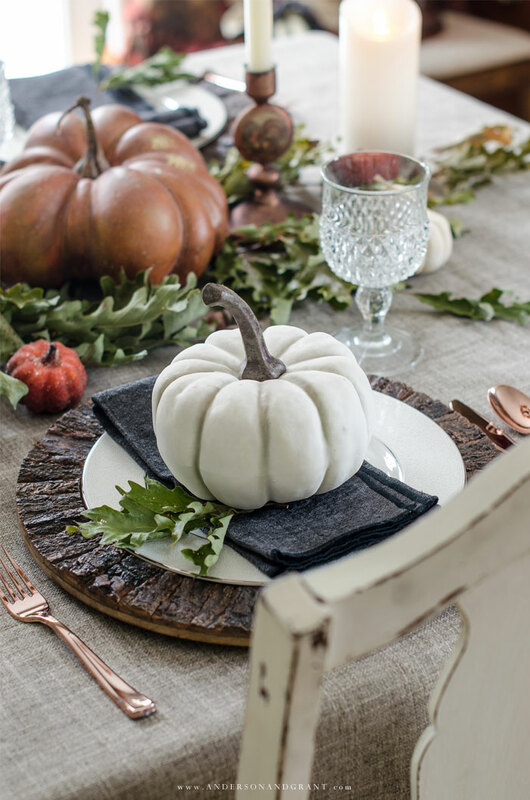 While the pumpkin looks pretty when everyone sits down at the table, it is awkward for everyone to find a place on the table to place it so that they can eat! 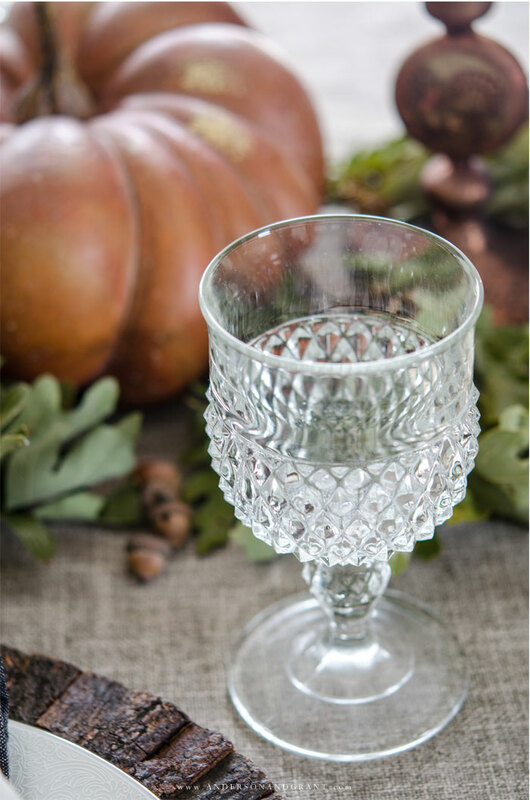 I hope these few tips and my Thanksgiving tablescape will help inspire you with what to do for your own holiday table. Remember that the most important part isn't what the table looks like or the food you serve, but rather the people you enjoy the day with.